The Board of Health meets on the first Wednesday every other month, or as otherwise designated, at 7:00 p.m. at the Borough Hall. Please refer to the Borough Calendar. The Health Department administers public health services designed to protect the health of our residents and promote a safe environment. Please Note: Many of the Borough’s Health Services are shared services in conjunction with Pequannock Township. Additional information, including information regarding local retail health inspections can be found on the Township of Pequnnock Health Department Website. Florham Park animal control services are provided by Millburn Township Animal Control. Residents who are in need of these services or who want to report a lost pet must call the Florham Park Police (non-emergency) @ 973-377-2200. It is very important that your pet wears his/her current registration tag for easy identification. If a dog is found to be loose and the owner is not known or cannot be located, the dog will be taken to the designated holding facility. The owner will be responsible for any impoundment fees and/or veterinary services provided. 1. Remove Food: Feral cats will stay in any area where food is plentiful. Avoid feeding your own pets outdoors and cover trash scraps securely to keep from giving unwelcome cats an easy meal. 2. Close Shelter: All wild animals need a place to sleep and to raise their young. Board up holes in sheds and garages, under decks and porches, or in simple shelters such as wood piles or window wells to avoid providing this shelter to feral cats. It is against the law in Florham Park to feed feral cats and other wildlife. Violators are subject to prosecution and fines. Contact a carcass removal service to have the carcass removed at your expense. 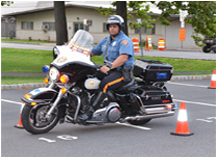 Move the carcass to the roadway and contact the Florham Park Police to arrange for pick-up. However, if there is a nocturnal animal out and behaving abnormally, call the FP Police at 973-377-2200. Abnormal behavior can be walking in circles, staggering and falling over, appearing disoriented, unusually aggressive or unusually tame. All dogs and cats that are at least 7 months old must be licensed each year by the Borough of Florham Park as per Chapter 96 and Chapter 108 of the Code of Florham Park. Dog and cat licenses must be renewed by January 1st of each year. N.J. state law requires that all animals must show proof of a current rabies vaccination that is valid through November 1st of the licensing year in order to renew. There are no exceptions. To download an application, click on the “Quicklinks” tab on the homepage and then click on “Forms.” The pet license application will be listed under Board of Health. Federal law, under the Americans with Disabilities Act (ADA), mandates that businesses and organizations that serve the public must allow people with disabilities to bring their service animals into all areas of the facility where customers are normally allowed to go. This federal law applies to all businesses open to the public. Mosquito breeding around the home can be reduced considerably by eliminating standing water available for mosquito breeding. Dispose of metal cans, plastic containers, ceramic pots or any other water holding containers that have accumulated on your property. Clean roof gutters annually, particularly if leaves from surrounding trees have plugged the drains. Roof gutters are easily overlooked but can produce millions of mosquitoes each season. Aerate ornamental pools or stock them with fish. Water gardens will become major mosquito producers if they are allowed to stagnate. Clean and chlorinate swimming pools that are not being used. A swimming pool that is left untended by a vacationing family for an extended period of time will result in an infestation. Mosquitoes can even breed in the water that collects on pool covers. Over the counter and prescription medications should not be disposed down the drain because wastewater treatment facilities are not designed to remove pharmaceutical compounds. These medications may end up in local waterways, and may eventually be found in drinking water. Properly disposing of unwanted and expired prescriptions and over-the-counter medications in the trash promotes a healthy aquatic environment and prevents accidental poisoning as well as intentional abuse. The Florham Park Police Department can now accept unwanted, unused and expired prescription medications 24 hours, 7 days a week. The unit is located in the main lobby of Florham Park Borough Hall. Safe Syringe Disposal Program – Contact Morristown Medical Center for information: 973-971-5000. Physicians – Ask your physician if he/she will take your used syringes once they are properly placed in a container. Your syringes must be place in rigid containers that will protect people from needle sticks. Use containers that are unlikely to break open on the way to the landfill. You can use empty laundry detergent bottles or 2-liter soda bottles or other rigid containers with screw-on caps to dispose of needles and syringes. Also, check with a pharmacy to see if they sell commercial containers specially designed to hold sharps for disposal in your household trash. Buy an inexpensive hand-held needle clipper from the pharmacy. Using anything other than a clipper to break a needle is not safe. After clipping the needle, carefully place each of the used needles and syringes into a plastic bottle with a screw-on lid. If possible, the user should clip the needle and syringe and place them in the container. If the user is unable, it is recommended that the caregiver consult with the individual’s physician for further instructions. Seal the bottle tightly with the original lid and wrap duct tape over the lid after you fill the bottle with syringes. You may now dispose of the tightly sealed full container of syringes in your household trash – NOT in your recycling bin. Remember, although you may feel healthy, your used syringes can transmit germs and loose syringes can seriously hurt people. The Morris County Department of Human Services provides assistance to residents. For detailed information on services provided, please go to https://hs.morriscountynj.gov/ . Or you may call: 973-326-7800. The office is located at 340 West Hanover Avenue, Morristown, NJ 07960. Hours are from 8:30 a.m. through 4:30 p.m.
Madison – Rexford S. Tucker Apts. 211 is a three-digit telephone number dedicated to health and human services. 211 service is available throughout New Jersey 24 hours a day, 7 days a week. All calls are confidential. NJ EASE (New Jersey Easy Access, Single Entry) is the easy way for seniors and their families to get information on a variety of services. Please call 1-800-222-3737 for more information. Residents who are income eligible and are uninsured or underinsured may qualify for free cancer screening services. For more information, please call 1-800-328-3838. New Jersey FamilyCare provides free or low cost health care. For more information and for eligibility requirements, call 1-800-701-0710. Does your house need work? The Morris County Housing Rehabilitation Program provides funds to income eligible homeowners to address major system failures and repairs related to health or safety in their primary residence. For more information on this program, contact the Morris County Office of Community Development at 973-285-6032.